When owners & Innkeepers Jen and Kevin travel, they love to “do as the locals do, and eat where the locals eat.” They want folks to enjoy their visit to Max’s as much as Jen and Kevin enjoy their travels. 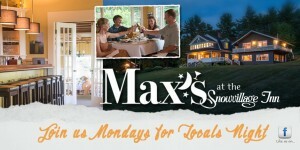 After a cocktail by the fire or on the porch, guests at Max’s settle in to enjoy tasty, creative, fresh fare. Their servers are knowledgeable, friendly and suggest unique cocktails, superb glasses of wine, or the best place to explore the next day of your trip. Kevin and Jen love delicious food. They have created a menu that focuses on flavorful classic dishes with a creative twist. 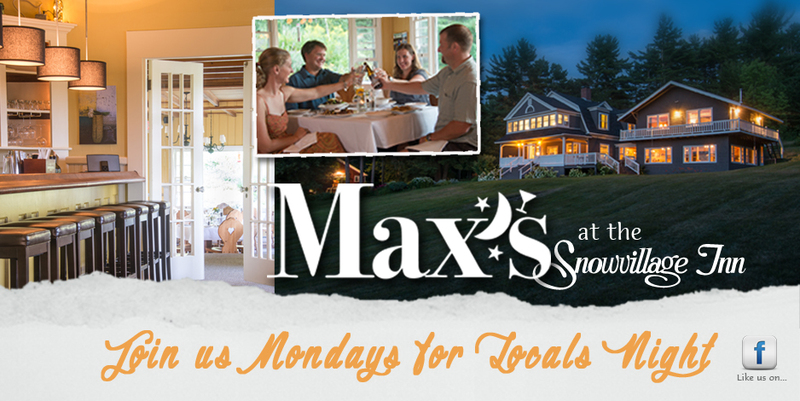 Local Farm to Table is a priority at Max’s at the Snowvillage Inn. Max’s prides itself on locally sourcing ingredients to add that special flavor to every dish. Gluten Free? Vegan? With our food made fresh from scratch, we can cater to any needs or desires. Whether you choose a full dinner in our casual fine dining room or drinks and appetizers in our relaxed pub, you will feel like you are at your favorite friend’s house. Our bartenders know the classic drinks, favorites from afar, and cocktails that are inspired from the local surroundings. Our regulars love our Blueberry Mojito~ fresh blueberries from the mountain in our backyard. We always have local beer, excellent wines, and a spirits menu that is unrivaled. Our stash includes small batch bourbons, single malt scotches, local and popular vodka as well as your old favorites. Bring your camera! Walking from the parking lot you will see an amazing view of Mt Washington and the Presidential range as well as our manicured gardens. From the porch and dining room you can watch the colors change over the mountains as well as the birds enjoy dinner from their feeders. Who knows maybe a moose or deer will walk through the lawn.